Hatters boss Nathan Jones was left disappointed by his side’s second half performance at Newport County on Saturday. After an entertaining first period in which there were chances at both ends, with Dan Potts’ header cancelling out Josh Sheehan’s opener, Luton looked they had more goals in them after the break. It was as positive a side as I possibly could have gone with, with the attacking players I had in my team. James Collins struck the bar, and forced a great save out of Joe Day, who also turned aside Elliot Lee’s deflected effort, with Scott Cuthbert and Luke Gambin off target too. 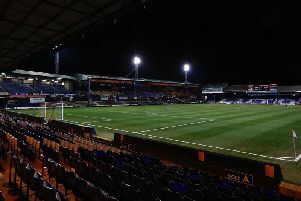 However, in the second period, Luton’s attacking threat virtually dried up, Danny Hylton nodding a corner wide and the visitors only really going close late on through Harry Cornick. Jones said: “The ironic thing is we were better first half against the wind than we were with it second half until late on, when Harry Cornick had a shot after Macca (Alan McCormack) got down the line, did we look like creating anything. “That’s the disappointing thing, we had a few people off it, it was a real difficult day condition-wise, it’s dry, it’s bobbly, we had to grind it out and battle. One of the changes Jones made to improve his side’s creativity was by handing Gambin his first start in just under six months, and on the decision, he continued: “He’s been bright in recent weeks Luke, so we felt he deserved an opportunity. “In recent weeks we haven’t kept clean sheets, so we thought we might need two (goals) to win it, so we played a really positive side. “It was as positive a side as I possibly could have gone with, with the attacking players I had in my team. “We did score, it’s just we gave ourselves a mountain to climb by conceding in the first two minutes. Striker Hylton was one who had a tough afternoon, well shackled by the home defence with his usually excellent touch deserting him at times, with Jones adding: “That wasn’t one of his most productive ones, but it’s difficult to take him off because of who he is. “He didn’t look as sharp, first half he was a lot better, second half he wilted a little bit, but he’s still coming back. One thing Jones didn’t doubt was his side’s fighting spirit to come back from conceding first, although he wishes it wasn’t such a regular occurence with that being the third game in a row now. He added: “We should have good character to come back as we’re making a habit of doing it, so we’re having to come from behind. “Accrington was against the run of play, it really was and we can’t fathom for that. The last two away games, we’ve given ourselves a mountain to climb in terms of conceding first. “Teams are not having to earn that, it’s bad, bad defending, and that’s the thing I’m disappointed with. “Because apart from that, they put their head on it, they grafted, they worked hard, but it’s just we have to chase a game. “First five minutes we were under the most pressure, we didn’t start well which was ironic really as we knew Newport come here and there’s not real fluency in the game, they take a lot of long throws, that takes time.